Thomas Ebenstein was born in Carinthia/Austria in 1979. He received vocal training from Helena Łazarska at the Vienna University of Music and Dramatic Arts and is still coached by her. Graduation with honours in 2004. He also studied German Lied with Robert Holl. In 2001 he won the International Antonin Dvořak Competition in Karlovy Vary (Czech Republic), in 2003 the Musica Juventutis Competition at the Vienna Konzerthaus, in 2005 the International Heinrich Strecker Competition in Baden near Vienna and in 2007 the Richard Wagner Scholarship Foundation granted him a scholarship for the Bayreuth Festival. From 2003 to 2012 Thomas Ebenstein was a member of the Berlin Komische Oper (among other roles he sang Mozart: Don Giovanni – Don Ottavio, Mozart: The Abduction from the Seraglio – Pedrillo, Mozart: The Marriage of Figaro – Basilio, Mozart: The Magic Flute – Monostatos, Beethoven: Leonore – Jaquino, Beethoven: Fidelio – Jaquino, Weber: The Marksman – Kilian, Wagner: The Mastersingers of Nuremberg – David, Bizet: Carmen – Remendado, Offenbach: The Tales of Hoffmann – Andrès/Cochenille/Frantz/Pitichinaccio, Verdi: Rigoletto – Borsa, Tchaikowsky: The Queen of Spades – Chekalinsky, Smetana: The Bartered Bride – Vašek, R. Strauss: The Knight of the Rose – Valzacchi, R. Strauss: Salome – Narraboth & Fourth Jew, Prokofiev: The Love for Three Oranges – Truffaldino, Weill: Rise and Fall of the City of Mahagonny – Jack O’Brien, Berg: Wozzeck – Andres, Reimann: Lear – Earl of Kent; J. Strauß: The Bat – Alfred, Lehár: The Land of Smiles – Gustl, Sondheim: Sweeney Todd – Toby). Since the beginning of the 2012/13 season Thomas Ebenstein is a member of the Vienna State Opera. Among other roles he sang Mozart: The Magic Flute – Monostatos, Mozart: The Marriage of Figaro – Basilio, Offenbach: The Tales of Hoffmann – Andrès/Cochenille/Frantz/ Pitichinaccio, Massenet: Manon – Guillot de Morfontaine, Giordano: Andrea Chénier – Un Incredibile, Verdi – Falstaff – Dr. Cajus, Mussorgsky – Khovanshchina – Scrivener, Wagner – The Flying Dutchman – Steersman, Wagner: The Rhinegold – Froh, Wagner: Parsifal – Third Knight, R. Strauss: The Knight of the Rose – Valzacchi, R. Strauss: Ariadne on Naxos – The dancing master, R. Strauss: Salome – First Jew, R. Strauss: Elektra – A young servant, R. Strauss: Arabella – Count Elemer, Tchaikovsky: Eugen Onegin – Triquet, Tchaikovsky: Pique Dame – Chekalinsky, Prokofiev: The Gambler – Marquis, Janáček – Káťa Kabanová – Kudrjáš, Janáček: Věc Makropulos – Vitek, Weill: Rise and Fall of the City Mahagonny – Jack O’Brien, Einem: Danton’s Death – Robespierre, Adès: The Tempest – Caliban, Staud: The Willows – Edgar (WP), J. Strauss – The Bat – Alfred. The tenor has made guest appearances at the Baverian State Opera, Staatsoper Unter den Linden, Dresden Semperoper, Staatsoper Hamburg, Deutsche Oper am Rhein, Grand Théâtre de Genève, Theater an der Wien, Vienna Volksoper, Theater Dortmund; Wiener Festwochen, Salzburg Easter Festival, Salzburg Festival, Festspielhaus Baden-Baden, Bochum Ruhrtriennale, Bergen International Festival, Hong Kong Arts Festival. He appeared there in roles such as Mozart: The Abduction from the Seraglio – Pedrillo, Mozart: The Magic Flute – Monostatos, Beethoven: Fidelio – Jaquino, Weber: The Marksman – Kilian, Wagner – The Flying Dutchman – Steersman, Wagner: Tristan and Isolde – A young sailor/A shepherd, Wagner: Parsifal – First Grail Knight, R. Strauss: Ariadne on Naxos – The dancing master, R. Strauss: The Knight of the Rose – Valzacchi, Tchaikovsky: The Queen of Spades – Chekalinsky, Tchaikovsky: Eugen Onegin – Triquet, Prokofiev: The Love for Three Oranges – Truffaldino; J. Strauß: The Bat – Alfred, Lehár: The Count of Luxemburg – Armand Brissard, Zeller: The Bird Seller – Adam, Bernstein: West Side Story – Tony. A CD live recording of Fidelio conducted by Sir Simon Rattle is available on EMI Classics. DVD recordings are available of Parsifal conducted by Christian Thielemann on Deutsche Grammophon, of The Abduction from the Seraglio from the Salzburg Festival on Arthaus Musik and of The Mastersingers of Nuremberg on Unitel Classica / EuroArts. 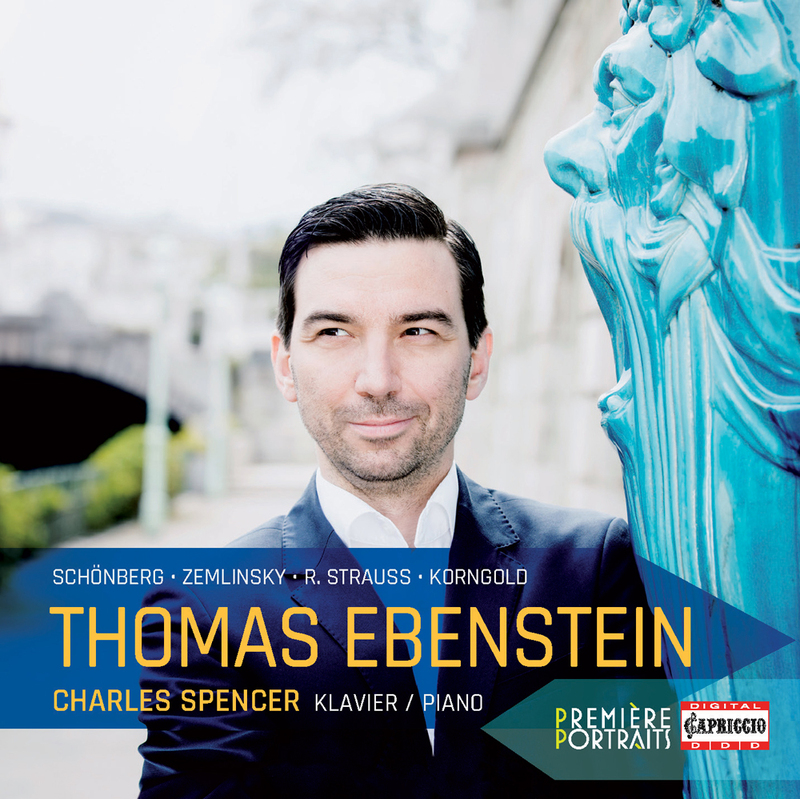 In 2018 his debut recording with Lieder from R. Strauss, Schönberg, Zemlinsky and Korngold was released on Capriccio (Première Portraits). Thomas Ebenstein has worked with a number of prestigious conductors such as Thomas Adès, Alain Altinoglu, Marco Armiliato, Philippe Auguin, Bertrand de Billy, Placido Domingo, Christoph Eschenbach, Alfred Eschwé, Adam Fischer, Daniele Gatti, Manfred Honeck, Jakub Hrůša, Marek Janowski, Konrad Junghänel, Michail Jurowski, Patrick Lange, Louis Langrée, Friedemann Layer, Jesús López Cobos, Cornelius Meister, Zubin Metha, Ingo Metzmacher, Marc Minkowski, Andris Nelsons, Yannick Nézet-Séguin, Erwin Ortner, Kirill Petrenko, Sir Simon Rattle, Helmuth Rilling, Peter Schneider, Michael Schønwandt, Stefan Soltesz, Jeffrey Tate, Christian Thielemann, Alexander Vedernikov, Franz Welser-Möst, Simone Young, and producers such as Calixto Bieto, Willy Decker, Karoline Gruber, Stefan Herheim, Andreas Homoki, Richard Jones, Peter Konwitschny, Barrie Kosky, La Fura dels Baus, Uwe Eric Laufenberg, Nikolaus Lehnhoff, Moshe Leiser, Robert Lepage, David McVicar, Andrea Moses, Hans Neuenfels, Andrei Șerban, Peter Stein and Mariusz Treliński. Apart from singing in opera houses, the Austrian Tenor performs in concerts at the Vienna Musikverein, Vienna Konzerthaus, Berlin Philharmonic, Hamburg Laeiszhalle, Schleswig-Holstein Music Festival, New York Carnegie Hall, NTR ZaterdagMatinee at the Amsterdam Concertgebouw, Auditorium di Milano, Cracow Philharmonic and the Pomeranian Philharmonic Bydgoszcz. In addition, he performs Lieder (accompanied in particular by Charles Spencer and David Lutz) and sacred vocal music.